All this talk of dieting makes me thirsty. Despite cutting back on food I'm certainly not slacking on my enjoyment of regional craft beer. 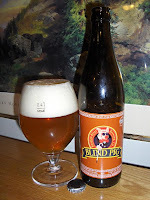 This week I opened up a bottle of Russian River's Blind Pig IPA. I've been looking forward to this bottle for about 2 1/2 weeks now ever since the big beer run to DaveCo liquors. The Blind Pig is one of three Russian River beers that are now sold here in Colorado since the end of August. Like it's brother, Pliny the Elder, this bottle warns you not to age this beer. Russian River believes that in order to fully enjoy the big flavor of this beer that it be consumed promptly while all the ingredients are fresh. Who am I to argue that? The brew pours a light copper or mostly orange in color and comes with a white frothy head. The beer itself is not exactly clear as within my glass I could see hundreds of tiny suspended particulates in the brew. At first I thought they were bubbles but they didn't move around and just sat there suspended in the beer. Perhaps this brew is unfiltered or rather it was bottle conditioned and it was merely some leftover yeast. There was very little (if any) lacing that stuck to the glass. The label is marked with the date it was bottled (July 22, 2008) and I sampled this on September 12, 2008. So just less than 2 months old. As I poured this beer I could really smell the big piney / citrusy aroma. Mmmm it smelled wonderful. So how's the taste? Ooooh ya. The 1st taste was hoppy, malty and very smooth. It wasn't dry and wet my mouth very well. This was an excellent example of an American IPA. It was flavorful but not over the top. Russian River went for quality and not quantity here. I really can't say anything bad about this brew. I enjoyed this beer just as much as Pliny the Elder. It has about 6.1% ABV and a nice high IBU rating. It's just about right to drink a couple of bottles of this in a session. Again, this beer, like Pliny, comes in a 16oz bottle. I love this size as 12oz probably would leave me asking for more. I really enjoyed this beer and look forward to buying this again in the near future. I'll give this beer a big thumbs up and a nice 3.5 out of 5 ranking. - Pliny the Elder review. - Colorado celebrates Russian River day. - Collaboration Not Litigation Ale - Review.